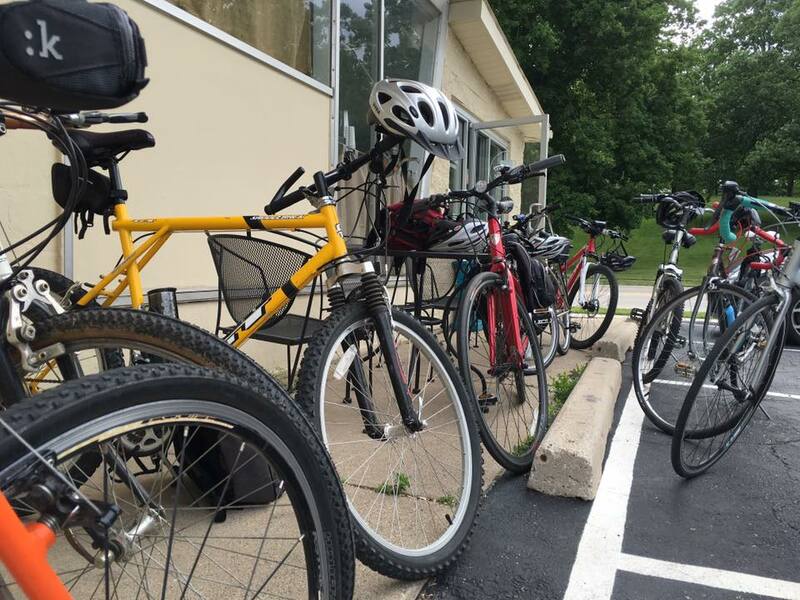 This week is Bike to Work Week in Waukesha County, part of a greater Wisconsin Bike Week celebration put on by the Bike Federation every year. As part of it the County hosts events throughout the week to try and raise awareness for employees. 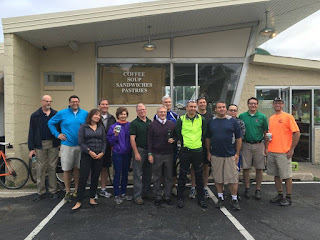 Because I bike to work, literally every day through the three seasons, I am always on the BTWW committee. I serve mainly as the guy who plots the posters, as our department has one of the few plotters in the county. This year, they decided to step up the events by trying to coordinate a joint event where the County Executive and the Mayor of Waukesha. They set a location, Mama D's in downtown Waukesha for an hour of coffee, trail bars and photo ops. It was set to run from 7:00 - 8:00 and then weave it's way through Frame Park, past City Hall, and on to the County Courthouse. So I showed up at the event on Tuesday about 7:15 or so and there were probably 15-20 people milling about inside the building. I went inside and was greeted by a gentleman in a green shirt. The two of us made small talk for a bit and then I asked, "So, do you work for the city?" To which he replies, "Yeah, I'm the Mayor." It turns out he was a good sport about it, a super humble, easy going guy. I'd acutally met him once before at a planning event, but I drew a blank when I was talking to him. I'm terrible with names anyway, but I likely won't make this mistake again. Anyways the event was good and we had a fun ride. I'm used to riding much faster of course, so it was hard riding so slow. While the event was to raise awareness about the benefits of biking to work, every year it's the same thing. We get a picture of a few people that ride to work a day or two that week, then everyone ends up back in their car the following week. So while I get the idea, I think it's kind of a hypocritical event. Now, I know not everyone can live close to work (I live < 2 miles from work), and that Waukesha is not a terribly bike-friendly city, but still, there are but a handful of people who bike regularly. Someday I'd like Waukesha to become as bike friendly as Madison or Portland, Oregon. We'd be a healthier population, our environment would be better and traffic wouldn't be as trafficky. In the meantime, I will continue to bike to work, bike for recreation and bike to writing class. Some days I have to remind myself that I'm 54, and not 23 when I'm cruising through traffic. Trying to minimize my impact and maybe do a little for my health along the way.